All busbar protection schemes are mostly designed for earth faults. Each conductor is surrounded by the earthed material barrier. All the metal frameworks are bonded together and insulated from earth. The switchgear frameworks is also insulated from lead cable sheath. The arrangement of frame leakage protection to a single busbar substation with a switchgear unit is shown in the Fig.1. Metal supporting framework known as fault bus is earthed through a CT. When the fault is there, a contact between conductor and earth results. This drives current through this CT. This energizes the frame leakage relay. The CT energizing the check relay is mounted in neutral earth of the transformer. The contacts of check relay and frame leakage relay are in series. Thus before tripping circuit gets energized both the relays must operate. Once both the relays operate due to earth fault, all the breakers will trip connecting the equipment to the busbar. 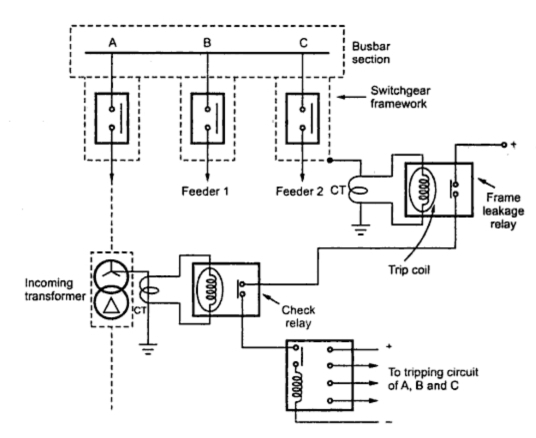 Due to check relay, accidental operation of single relay to trip the circuit gets avoided.